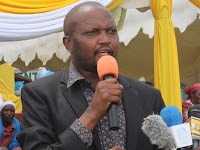 Friday September 14, 2018 - Gatundu South MP, Moses Kuria, has lauded a move by President Uhuru Kenyatta to reject the amended Financial Bill of 2018, which would have postponed introduction of 16% fuel levy to 2020 saying it was a victory for "sober" politicians. Through his Twitter account, Kuria, who represents Uhuru's Constituency in the National Assembly, said it was wise for the President to send the Bill back for further assessment. He noted that it was a gain for those who did not politicise the taxation move. He termed Uhuru's move, which went against many politicians' and public expectations, as good for national development because it would offer a platform to discuss and agree how to raise funds for Jubilee's Big Four Agenda. “Under the din of political noise, it is a win for those of us who remained sober throughout," said Kuria. "Now we will relook at both fuel Value Added Tax and employer-employee 1.5% Housing Fund contribution for the Big Four Agenda," he added.